BioNumerics provides comprehensive metagenomics tools for the characterization of microbial communities using deep sequencing of a phylogenetic marker (e.g. 16S rRNA). 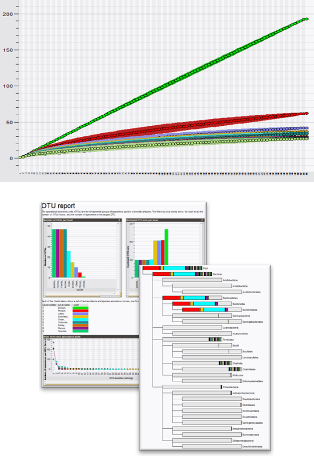 Operational Taxonomic Unit (OTU) quantification, visualization and comparison of microbial communities starting from the raw sequence reads now becomes feasible! Generation of OTU reports after identification of metagenomics samples against a taxonomic reference database. Evaluation of single sample diversity for the different taxonomic levels using several within-sample and community diversity indices and curves (e.g. Inverse Simpson index, Collector curves and Rarefaction curves). Use BioNumerics’ wide range of data mining, clustering, identification and statistical tools for sequence clustering, visualizing OTU abundances and evaluation of alpha- and beta-diversity. Define OTUs either from a similarity cut-off on the sequencing clustering results or from the consensus taxonomy on a specific phylogenetic level defined per cluster. Assess the within-sample diversity, community evenness, community richness and community diversity. BioNumerics allows fast identification of all metagenomics sample sequences against taxonomic reference databases, which can be user-specific or downloaded from public repositories such as the SILVA rRNA database project. Summarize your metagenomics results using a variety of 2-D and 3-D visualizations, such as MDS, non-metric MDS, PCA, data mining, charts & statistics and geographical plotting.